12 Days of Christmas at TWAC! ABOUT THE SHOW: 12 groovy artists each represent one of the twelve days of Christmas. Some use paint, some use ink, some made up their own rules. Multiple mediums, multiple artists, multiple days to check it out. AND you can also take home a postcard set of all 12 pieces for $12! All profits going to Treehouse giving foster kids a childhood and a future. FEATURED ARTISTS: Justin Hillgrove, Debbie Bianchi, Kevin Sullivan, Kate Protage, Joseph Brooks, Kelly Rae Cunningham, Randy Phillips, Matt Calcavecchia, Jenna Colby, Mike Capp, Twozdai Hulse and Michelle Anderst. 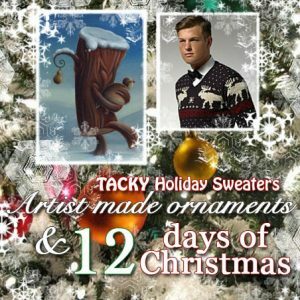 TACKY HOLIDAY SWEATER & TREE LIGHTING OPENING PARTY: Thursday, December 8th, during the West Seattle Art Walk, 6-9PM! ALSO FEATURING: Ornaments made by Twilight Artists to adorn your tree! Come get ’em while they last.